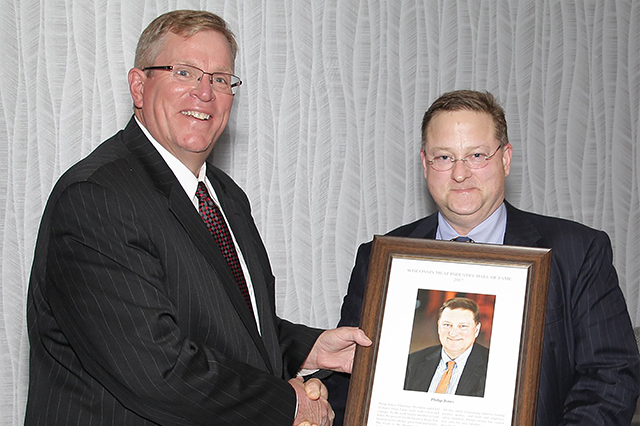 Jones Dairy Farm President Philip Jones was one of three individuals with outstanding lifetime contributions to the meat industry inducted into the Wisconsin Meat Industry Hall of Fame Class of 2017 held at a recognition ceremony on May 4, 2017. The Wisconsin Meat Industry Hall of Fame was created in 1993 to recognize individuals who have made significant contributions to the meat industry in Wisconsin. The Hall of Fame program is coordinated by and housed in the University of Wisconsin-Madison Meat Science and Muscle Biology Laboratory. Philip, who is the sixth generation to lead the family business, is also the third member of the Jones family to be inducted into the Wisconsin Meat Hall of Fame. Milo Jones, the founder of the company, was inducted in 1994, and Philip’s grandfather Edward Jones, a third generation of the Jones family to head the firm, was inducted in 1997. Philip Jones has always been passionate about family and great food, and anticipated becoming part of the family business. But as early as the 5th grade, Philip also had a love for cooking. This passion ultimately led him to Paris, where he trained to become a chef at La Varenne. Following graduation, Philip returned to the United States, working for more than 10 years as a professional chef. In 1991, Philip joined Jones Dairy Farm as the operations manager of Ralph & Paul Adams, a subsidiary plant located in Delaware. Throughout the 1990’s, Philip took on increasing positions of responsibility that gave him experience in many facets of the business. On September 1, 2001, Philip became President and CEO, taking over for his father, Edward C. Jones, Jr. Philip is also the President of the company’s three subsidiary businesses that include Ralph & Paul Adams, Habbersett, and Sunshine Burger & Specialty Foods. Philip is the eighth president of Jones Dairy Farm, and all of his predecessors had the last name Jones too. As a result, Philip has made it his mission to carry on the Jones family legacy of doing things the right way, steeped in tradition and honesty, just like founder Milo would have wanted. This includes the use of simple ingredients and original recipes. Philip is a visionary who has effectively positioned Jones Dairy Farm for the future by making courageous yet pragmatic decisions allowing the company to more than double in size since taking over leadership of the family business. His vision resulted in significant, much-needed changes such as moving away from direct-store-delivery distribution, automating production to drive operational efficiencies, and improving Jones’ competitiveness in the marketplace. Philip was instrumental in expanding production capacity to serve a growing and global customer base, shuttering a 100-year-old plant and converting it to a culinary center, creative studio and retail market featuring Jones products and Wisconsin-made specialty goods. This complex, which is a tangible tribute to Jones family traditions and history of the company, wouldn’t exist without Philip’s vision and passion for both family and great food. To learn more about the Wisconsin Meat Hall of fame, visit http://www.ansci.wisc.edu/Meat_HOF/.